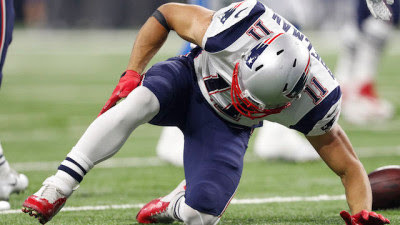 The New England Patriots have lost WR Julian Edelman for the season to a torn ACL. In our most recent WR rankings update, Edelman was our WR24 heading into primetime fantasy football draft season. Brandin Cooks gets a slight bump while Chris Hogan becomes draftable. Danny Amendola will find a way to vulture TDs each week while Malcolm Mitchell would also see a slight bump, but not sure how much it helps him. Tthose pass catching backs New England has are also more valuable, but not sure who between James White, Rex Burkhead and Dion Lewis. In other fantasy football news tonight, Spencer Ware was also carted off the field tonight in the Chiefs preseason game. He miss significant time with PCL/LCL damage, which means Kareem Hunt climbs up into the top 20 running backs and would probably keep the starting role all season long. Hunt was already ranked RB42 in Friday's update.